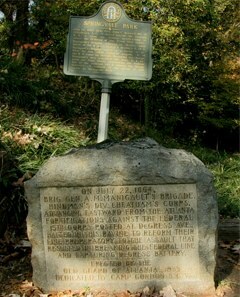 A remnant of battlefield terrain is located in the southwest section of Springvale Park, near the intersection of Waverly Way and Edgewood Avenue. Park on Waverly Way, walk into the park, and look for a historical marker titled "Springvale Park" in the ravine below street level. Springvale Park is near the intersection of Waverly Way and Edgewood Avenue. After turning left, park on Waverly as marked in blue on the map below (click for a larger version). 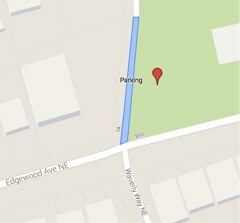 From the street, walk into the park and find the "Springvale Park" historical marker (the red pinpoint on the map).